Items 78- out of displayed. BitCoin moved up to 8000 and touched some important Fibonacci levels that can impact the bull trend. In our video we will also look at NZDUSD and CRUDE OIL. For Crypto Currencies pdf. report sign up here. Its FREE!! USDCHF is on a strong rise, after breaking through some important levels and a trendline on the daily chart so we see market turning bullish, currently making a five wave rise. Specifically we see price trading within corrective wave 4), that can cause a strong push higher soon into wave 5 this week; out of a triangle which is a continuation pattern. 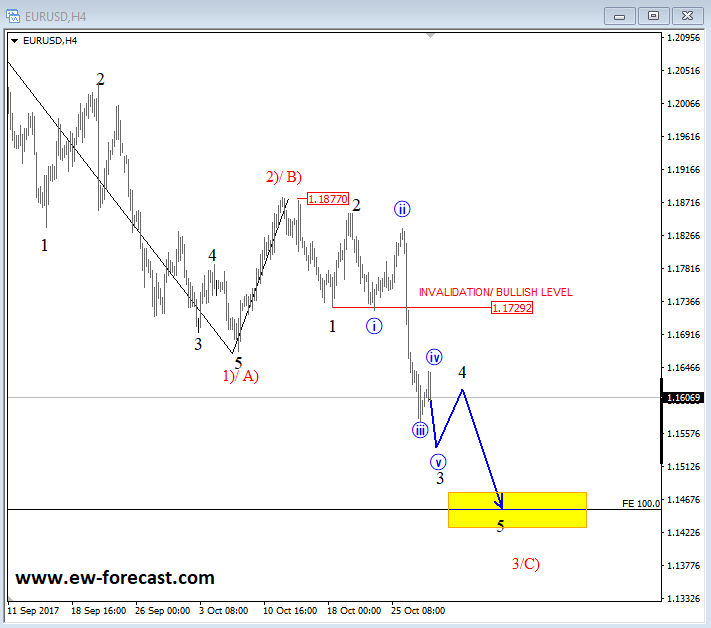 Break of wave D swing high opens door for 1.02/1.03. 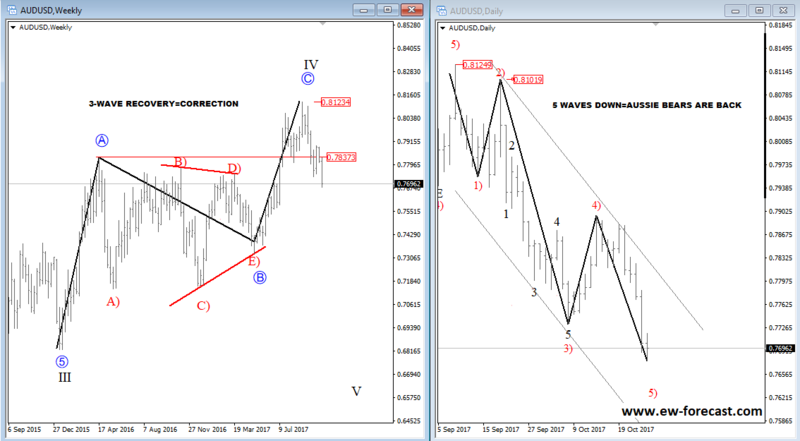 EURUSD broke down last week through 1.1730 level that caused a drop to a new low of the month which impacted some of recent bullish wave structure. What is really important at this stage is that current drop is accelerating which normally occurs in wave three, so we think there can be a new five wave drop in progress right now from 1.1877 Oct 12 swing since current leg is the strongest bearish reaction since September high. It's very important to listen the market and not get "married" to the "bullish idea". That said, we adjusted the structure and are now looking at a three wave drop from the September high which can either be a new five wave drop in progress for new euro bearish cycle, or is going to be just a deep A-B-C pullback. In either case there is room for pair to touch 1.1450-1.1500 area, especially if we consider an important zone on a daily time frame. 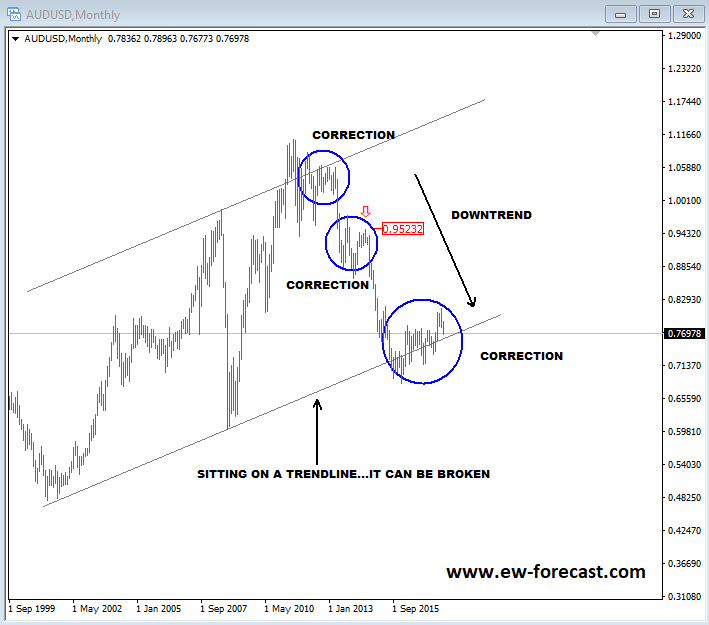 There have been a lot of talks this year about a trend in change on AUDUSD pair as pair holds 0.6800 for two years now. Always, before you want to make a conclusion about the direction of a trend make a step back and look at weekly or monthly charts, and ask yourself. Is this uptrend or downtrend? Is recovery from recent extreme sharp or slow? Once you have answered these questions you can make a prediction for next probable move, which I think can be lower. Look at monthly price action; I see a strong decline from 2011 high all the way down to a trendline connected from 2001. Notice that market did not go anywhere far lately, it’s just testing that trendline which can be breached in months ahead, if we consider that recovery is not looking strong from 2015; rather slow, thus corrective which is normal after that strong decline down through 2014 and 2015. If we go even further and scroll down to a lower time frame, like a weekly chart then we can see that rise from 2015 was in three waves. And here comes the interesting part when it comes to Elliott Wave theory, which says that three wave rallies in downtrend are corrections, same like a three wave decline in uptrend that are also temporary set-backs. In other words, its just a pause within major trend, a sideways move that is trying to confuse a trader. That’s why is always important to make a step back, look at the bigger picture before make any trading decisions. Also, what we think is important is that turn down from recent high is impulsive if we look at daily chart, next to a weekly. It’s a five wave fall, not a three wave move, therefore it’s an important evidence of a new or temporary bearish trend. There are also another inter-market relationships with gold, 10 year US notes and other markets that suggest more AUDUSD downside ahead. But we can talk about this in some other post. We have seen some nice breakdown on NZD/USD last week, a push below two-year old trendline support which means that pair can be in a new bearish cycle. We are tracking an impulsive decline, meaning that weakness is expected to stay here until we see a big five wave drop from 2017 high. It’s a long way to go, thus an opportunity on the short side. I was looking for shorts overnight but missed them slightly above 0.7000, but want to give it a new try on a retest of that level, of-course after an a-b-c recovery that I expect to see by the week end. If you want to hear more about NZDUSD then I invite you to watch my latest video analysis, in which I also talk about big Head and Shoulder pattern on crude oil and bullish view on GBPAUD. If you want more updates daily on different markets (FX, GOLD, OIL, SILVER, BITCOIN) then now can be your chance. Today Bitcoin is breaking above 5000 level so we think it may be interesting to see where we go from here based on technical levels. 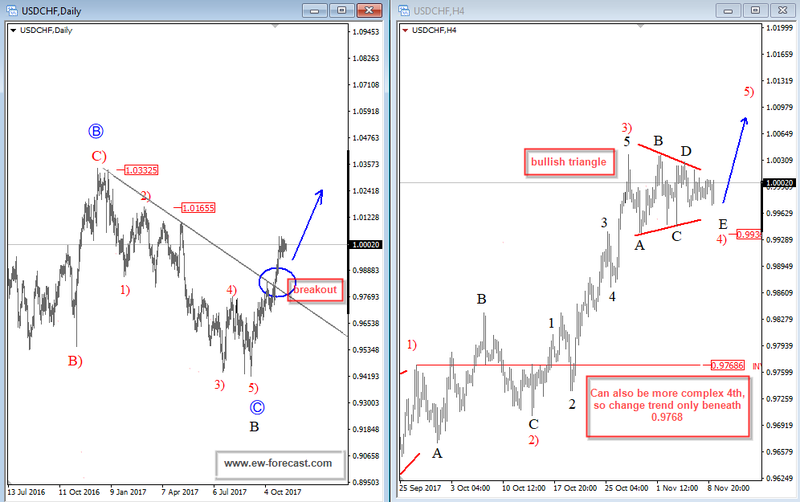 I will also make a quick look at the USD index and EURUSD.